With a month to go I am getting very excited for our second EdCampSWO this year being held at Tilbury High-school in Kent County. This year we are innovating by offering a few sessions from EdCampLondon, being held simultaneously, over WiFi! Here are my top 5 reasons to attend EdCampSWO. 5. Collaborate. Leading up to the day of our event I get to collaborate with amazing people. Brian Aspinall, David Fife, Sue Bruyns and the entire team for EdCampSWO are some of the most dedicated and innovative eds I have met. This year the collaboration has extended to working with EdCampLondon folks in order to offer simultaneous EdCamps with virtual connections using google hangout and LiveStream (Listen to @dougpete speak on An Educators Digital Footprint at 1 pm!) The collaboration keeps me on the cutting edge of understanding learning innovations. The collaboration deepens when I sit back and listen to the individuals who have chosen to use their Saturday to connect with other educators and continues long after the event. 4. Dialogue. Human understanding evolves by way of dialogue between mutually passionate perspectives. Conversation at EdCamp crosses the line into dialogue. When speaking with educators about professional learning the common theme of dialogue comes through. Educators appreciate and yearn for the dialogue that drives deeper understanding and allows them to share risks, mistakes, successes and celebrations. EdCamp provides safe space to do this. Participants choose where to dialogue, what about and with whom. If the dialogue does not meet the participants learning needs they are free to move to a space that does. 3. Own Your Learning. At EdCamp participants run the show. They determine the sessions, deliver the sessions and create the content by virtue of the dialogue that happens within the session. Participants vote with their feet. If they are not feeling it they are encouraged to leave and find a session more suited to their needs. One cannot possibly get to all sessions. 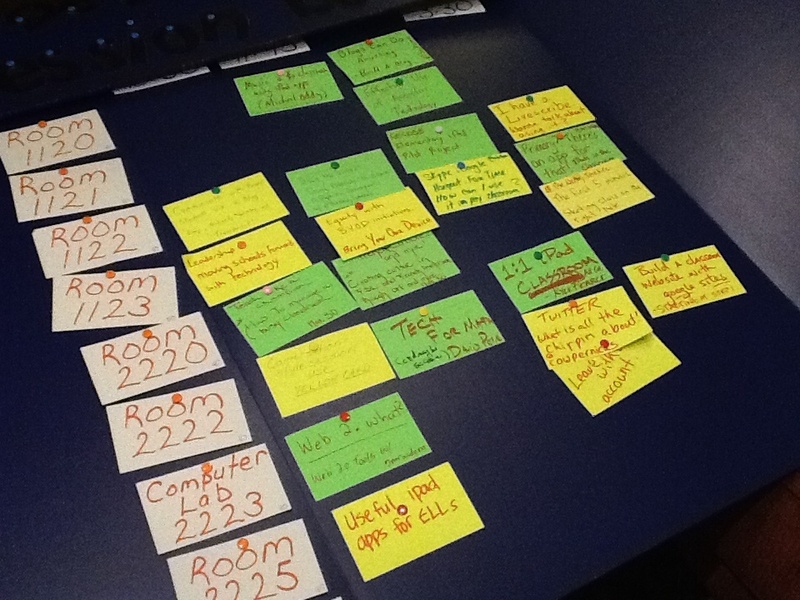 At EdCampSWO we have the capacity for upwards of 50 sessions. Participants can go as deep or shallow as they wish. The learning is free of charge and costs the participants only the time they decide to devote to the learning. This is a day to extend your PLN with F2F meet ups, take risks by sharing your learning story and challenge your current classroom practise. 2. Technology Integration and “SAMR.” At EdCampSWO we can guarantee you will learn of some innovations using technology to the power of SAMR! Teachers step up and share apps, tools, devices and other innovations that are capturing student voice and learning and further redefining learning in their classrooms. Teachers are leveraging the tools in the classroom to deepen understanding and broaden applications of students’ critical thinking. 1. Leadership Exercise. Whether you come to EdCampSWO with a plan to step up or to make room you are coming with a growth mindset. By joining us you are exercising your leadership potential. Your students are relying on you to find new ways, seek new understanding and change methodologies in order to meet their needs. To do these things, to learn essentially, you need to exercise your leadership and change your way of doing things, permanently. Bravo. 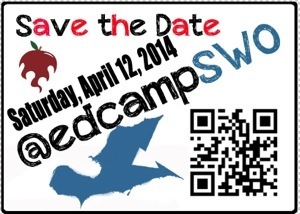 We trust that you will have a great experience at EdCampSWO this year. Please take the time to register, participate, present and buy the T-Shirt!